The New South Wales Deep Green Biotech Hub (DGBH), located at the University of Technology Sydney, brings together researchers, SMEs, industry, start-ups, students and other stakeholders to propel NSW to the forefront of algae-based biotechnology innovation in Australia. If we continue to live on the Earth using resources the way we current do by 2050, when the global population reaches nine billion, humanity will require the resources of three Earths to maintain. 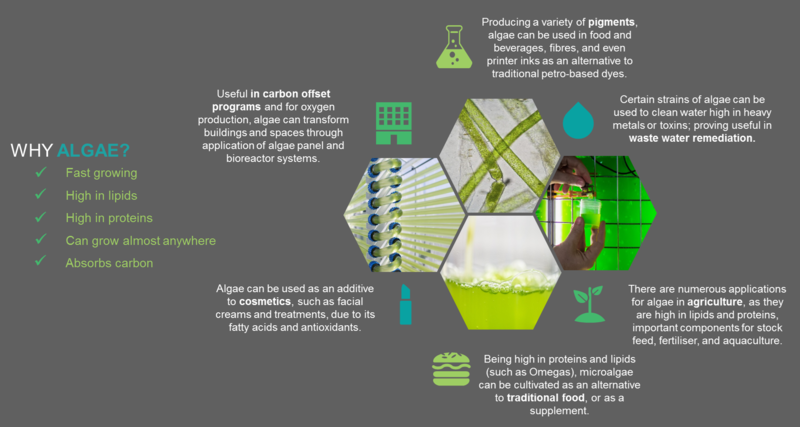 Algae biotechnologies are a sustainable alternative that efficiently converts abundant sunlight and CO2 into mass raw materials suitable for agriculture or energy production or can be used in a controlled environment to manufacture complex chemicals, pharmaceuticals and peptides. The DGBH provides support to start-ups and entrepreneurs to launch new businesses, existing companies to adopt algae biotechnologies, and enables students to learn about how these biotechnologies can transform industries. In all of these cases expertise on business model development is matched with rigorous scientific research to ensure partners have a robust research plan and strategy to adopt these innovations. Quicker identification of commercial opportunities for the algae-based biotechnology sector. Interdisciplinary problem solving for manufacturing roadblocks. Access to established facilities and infrastructure, for qualified prospects, to accelerate research and development. 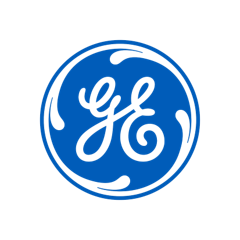 Pilot manufacturing facilities to produce validation samples of products, including GMP-Lite (opening 2019) facility for pharmaceuticals, analytical equipment and tools and raceways and photo-bioreactors for aquaculture feedstock development. If we continue to live on the Earth using resources the way we current do by 2050, when the global population reaches nine billion, humanity will require the resources of three Earths to maintain. Algae biotechnologies are a sustainable alternative that efficiently converts abundant sunlight and carbon dioxide into mass raw materials suitable for agriculture or energy production or can be used in a controlled environment to manufacture complex chemicals, pharmaceuticals and peptides. The Deep Green Biotech Hub offers a variety of support programs to industry and entrepreneurs in developing new biotechnology-based businesses – including our Green Light accelerator program. Get in touch to learn how we can work with existing businesses, entrepreneurs, and students to create new sustainable biotech products, services and businesses; offer advice; or develop educational or engagement programs. For Entrepreneurs and start-ups, the Deep Green Biotech Hub offers curated support to help you to develop and test a business model. We aim for you to have a customer validated business model with critical scientific evaluation associated research plan ready to pitch to investors. Once your business is funded your links to the hub and it’s resources will enable you to enact this research plan and develop your business. There are many different options for getting involved with Deep Green Biotech Hub, including our Green Light accelerator program. Want to know amore? Go to our Green Light page or contact us. For students the Deep Green Biotech Hub offers students from all disciplines a chance to observe the cutting edge of what is possible with emerging biotechnologies. Whether you are from science, fashion, business or health there are opportunities to learn and apply this knowledge to your field; contact us to learn more. Want to know more about being a student with the Deep Green Biotech hub? Go to our student page or contact us. Existing businesses can benefit from working with the Deep Green Biotech Hub’s tailored services, whether you are a small business looking at a business model transformation or a large business looking to launch a new product the Hub is here to support you with high quality science. We will work with you to understand your existing business model, develop prototypes for new products, test and refine these, ultimately working with you to develop a detailed research plan to develop these new products or services. There are many different options for established firms getting involved with Deep Green Biotech Hub, including our Green Light accelerator program. Want to know more? Go to our Green Light page or contact us. Note: for all of the above engagement mechanisms an organisation may be eligible for a R&D Tax Incentive (opens an external site), which may result in up to 45% of the eligible research expenditure being recovered from the Australian Taxation Office. Details of more 2019 events coming soon. Sign up to our mailing list to receive up-to-date details of DGBH events. What can you do with algae? Ever wanted to take a peek inside the Deep Green Biotech Hub? We conduct free tours of our world-class facilities every month, giving visitors a first-hand look into the algae facilities supported by the Deep Green Biotech Hub. Click here to find out when the next tour is, and register your interest! In June 2018, the Deep Green Biotech Hub curated a panel as a part of the Vivid Sydney festival. Algae is the new black brought together fresh thinking expert to explore the future algae and its potential impacts on innovation, design and technology. The event was recorded for ABC Radio National’s Big Ideas program. Listen to the podcast here. Illuminating Sydney alongside some of the world’s leading artists and engineers, Deep Green Biotech Hub and UTS took algae to the heart of Sydney at Vivid Sydney festival! As part of Vivid Lights, Living Lights invited visitors to interact with a ‘forest’ made entirely of living, breathing algae. To read more about this innovative installation, read the ABC news report here or watch the making and the science of the installation. 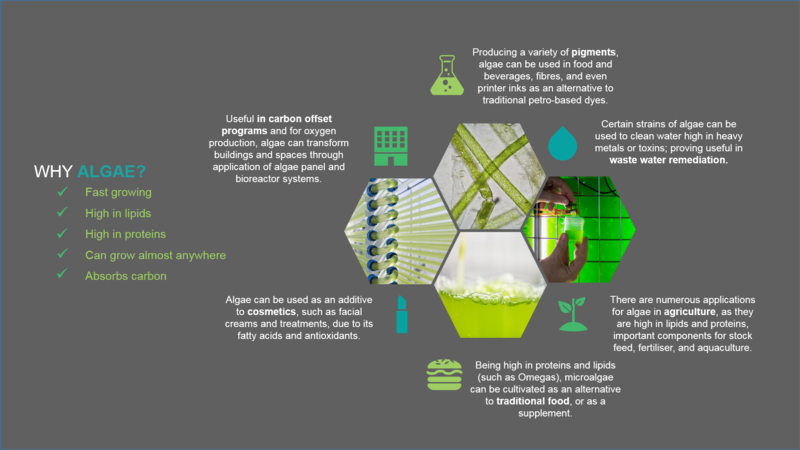 A multi-disciplinary team – including the Deep Green Biotech Hub – bringing together science, sustainable building design and architecture may soon develop the first living algae buildings in Australia. Their unique collaboration has seen a comprehensive feasibility study conducted on behalf of the City of Sydney, with plans to create the first flat facade algae panel this year. Deep Green Biotech Hub is proud to be featured in the 2018 Australian Universities Clever Collaborations, where it is highlighted that UTS is one of only a few sites in the world supporting the algae biotech industry. To access the full report, click here. TerraVia (formerly Solazyme) recently announced FDA approval for several new algae-based food ingredients for the North American market. These include two types of flour substitutes: high protein whole algae and lipid rich whole algae powder. The 2016 report, produced by a roundtable of stakeholders within the Australian algae industry, synthesised the views of scientists, entrepreneurs, government policy makers, and futurists. The report dives into detail about how algae could make Australia’s future, and includes detail about the diverse range of opportunites within this emerging industry within Australia.To access the full report, click here.